in concrete reclaiming and water treatment for all kind of concrete production sites. The company headquarter is located in Altlußheim a small town near Heidelberg. We focus on the design, construction and installation of custom made recycling plants in the adjacent workshop with the attitude “made in Germany”. Our company has been certified in accordance with DIN EN ISO 9001:2015 and DIN EN ISO 14001:2015. The experienced and dynamic team of ecofrog is composed of specialists with a huge reservoir of experience in recycling of green concrete. Together with our reliable partners in most of the European countries we would be happy to assist in working out a scheme for a recycling plant for your company. We specialize in the design and construction of custom made, turnkey recycling plants for the concrete industry. The most important system components are: Waste green concrete reclaimers, water clarifying silos, filter presses and neutralization systems with individually for the customer adapted control units and additional equipments. The waste green concrete reclaimer RE_X separates based on the principle of flotation with a separating cut at approximately 0,25 mm waste green concrete into its constituents washed out aggregates and grey water (Cement and fines suspended in water). The water overflows over a free overflow into a suitable stirring tank, from where it can be returned into concrete production. The sand and gravel mixture is discharged via an ascending vibration chute, simultaneously dewatering the mixture. The water is returned into the drum of the reclaimer and a perfectly washed out ready for reuse sand-gravel mixture is produced. In the water treatment tank AQUARE_X excess grey water is clarified. Excess grey water is created when due to the amount of grey water and / or colour pigments a complete reuse of the grey water in the production process is impossible. Grey water is pumped, if required under the addition of polymers, into the central pipe of the water clarifying tank AQUARE_X. The fines settle in the cone of the tank and are extracted via a system of valves. The maxi discharger assists in extracting the slurry. The slurry can either be dosed into the batching plant or dewatered in the filter press RE_XPRESS. Clarified green water overflows under the roof of the tank and can be buffered in an extra tank. This enables a distribution of pressurized green water throughout the factory via a centrifugal pump followed by a pressure vessel. The filter press RE_XPRESS dewaters cementious slurry. A filter cake with high solids content is produced, making the handling of slurry easier, and reducing the disposal costs. A high pressure pump squeezes slurry into the filter chambers formed in between the filter plates. Water passes through the filter cloth and is returned into the grey water basin. After pressing is the central filling system is cleaned and the filter cakes are discharged. The filter press is operated hydrau-lically. Filter presses can also be used to extract fines from grey water. In this way ready mix plants can reduce the density in their grey water basin. - No handling of hazardous, aggressive acids as chloridic - or sulphuric acid. - Low requirement in space and staff. ecofrog® designs and delivers neutralization plants with capacities up to 20 kg CO2 per hour. 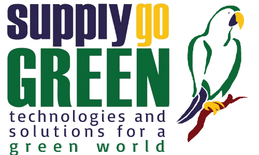 SUPPLYgoGREEN technologies for a green world, Mrs. Simone H.